Have you ever attended ISSE Long Beach? It is a smaller scale show in a gorgeous location. There are not a lot of nail things to do; however, with that being said, you have more time to do them! 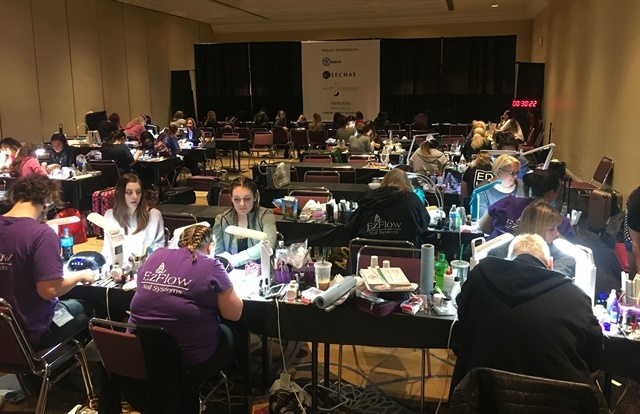 There are competitions going on, there are several great classes for nails, business, and social media, and the show floor has the nail booths grouped together so you don’t have to wander far to find the next nail booth. We also had an informal Nail Spot Social on Sunday afternoon so that nail professionals could stop by and chill in the Nail Spot knowing there would be some people to talk to. Doug Schoon stopped in and autographed some books as well as posing for pictures. 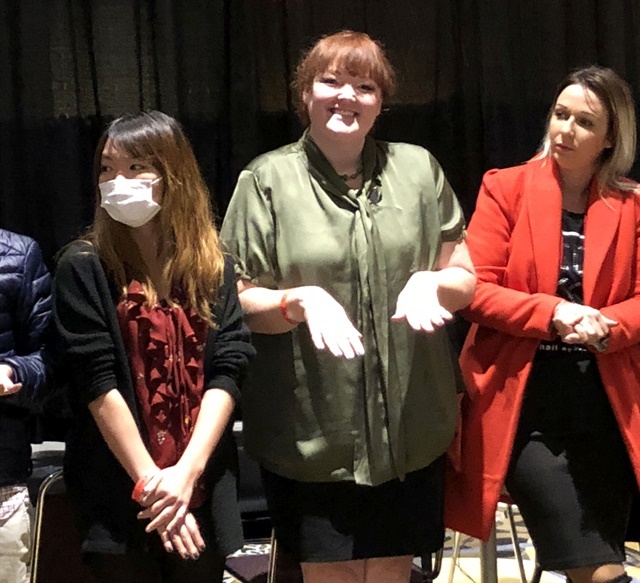 People from NAILS and Nailpro stopped in, and even NAHA-winning nail professional Sandy Clark was there. It was pretty surreal to sit chatting with the person whose nail designs were on several of the banners in the Nail Spot! Keep an eye out for an upcoming guest blog posts with tips on entering the nail category of NAHA! Sandy has some great suggestions that could help you feel more comfortable about giving it a shot. Speaking of competitions, I unexpectedly had the chance to model for Amy Becker in the soak-off gel division. It was pretty awe-inspiring to watch her work! If you have any interest in competing, I would suggest offering to be a model for someone so you can get a feel for the timing and the process of competing. All in all, it was a good trip. I’ve renewed my PBA membership for another year, enjoyed the attendees in my own classes, and touched base with nail friends. That’s a successful show!